When Bobby Jones and Alister MacKenzie first stepped onto the land that would become Augusta National, they were walking on the property previously owned by Fruitland Nurseries. The nursery grew millions of peach trees amongst other types of fruit, plants, and shrubbery. Also built on the land was Fruitland Manor, a large house at the high point of the property. You probably know it better as the Augusta National Clubhouse. After building the course, Jones and MacKenzie decided that each hole would bear the name of a plant that grew on the land. Some names have changed since their original designations, but the theme has remained the same. There have been 81 editions of the Masters, each one contributing a new piece of golf history. Augusta National has been a part of every golf legend’s career in one way or another. Which got me thinking, what if the holes were named after people instead of trees and shrubs? I mean, is there another option? Bobby Jones is widely considered one of the most influential golfers of all time and is the main reason Augusta National exists. After he retired from professional golf, Jones set out to build a course where he could play in private. Along with Clifford Roberts, he purchased the old nursery and co-designed the course with Alister MacKenzie. I imagine every person reading this knows that Bobby Jones founded Augusta National. For that very reason, the first hole would bear his name. He instituted the first Masters tournament in 1934 and started a tournament that would become the pinnacle of championship golf. Only one person in history has ever made a 2 on the 2nd hole. Louis’ albatross in the final round of the 2012 Masters sparked the beginning of a great battle between himself and Bubba Watson. It also marked the first time cameras caught a live albatross at Augusta National. The Sunday pin placement on the 2nd green is a perfect example of Augusta National “getting it”. Tucked in the back right, it requires an accurate shot to the center of the green but allows balls to feed close. This can help jumpstart a round and get players moving up the leaderboard early on Sunday. ANGC features a few of these pins on Sunday for that exact reason. It sparks excitement and drama. Louis took advantage of that philosophy and will live in Masters history forever. 17 players have made an eagle on the 3rd hole at Augusta, so you can forget Charl Schwartzel right this instant. Instead, we are paying tribute to one of the most underappreciated golfers of all time, Billy Casper. Billy Casper won 51 PGA Tour events throughout his career. That feat is even more remarkable when you think about his competitors being guys by the names of Palmer, Nicklaus, Trevino, Watson, and Player. He gets naming rights to the third hole because 3 of his 51 titles were major championships. Casper’s third and final major was the 1970 Masters, in which he beat Gene Littler in the final 18-hole playoff in Masters history. 4, the number of green jackets that Arnold Palmer won. More impressively, he won four in eight years. Starting in 1958, Mr. Palmer won every other year until 1964 and was the first person to win the event four times. The 4th hole is widely criticized as one of the lesser holes at Augusta National. It is extremely long and requires long irons to stop quickly on a firm surface. I feel a little bad putting such a great man’s name on such a meh hole, but it would give us all a reason to smile as we watch players go through this part of the property. While Bobby Jones and Alister MacKenzie are named as the artists behind Augusta National, their inspiration came from the OG architect, Old Tom Morris and the Road Hole at St. Andrews. In Jones’ own words, their goal was to reward "the good shot by making the second shot simpler in proportion to the excellence of the first." It is this fundamental principle that St. Andrews was built on and what inspired Jones & MacKenzie. They also did not want any shot too impossible to recover from, something that players only encounter next to the walls around St. Andrews. The addition of the rear bunker on the 5th hole is a perfect example as it prevents balls from bounding down the hill, ensuring a double bogey. Although Old Tom Morris never stepped foot in Georgia, his influence is on full display at Augusta National. Holes like 4, 5, 7 and 14 were all originally impacted by his strategic mindset. While renovations have taken some of that strategy away, we must never forget the influence he had on the Masters. Round of applause for anyone who knows who Ben Sayers is before reading this. You are on the right website. When Alister MacKenzie originally designed the sixth hole, his inspiration was the famed Redan hole at North Berwick, designed by Ben Sayers in the early 1900s. Mackenzie’s version played downhill with a slope that fed balls to the front left of the green instead of the back left. It also featured a mound in the center of the green that was essentially unmanageable with a putter. While a lot has changed on this hole over the last 80 years, MacKenzie’s original inspiration deserves recognition. The modern version is much more subdued but still features severe slopes that have Redan tendencies. Perry Maxwell is credited with helping reduce the severity that the original design featured. The modern day 7th hole would be completely unrecognizable to Alister MacKenzie. The original design was bunker-less and designed to play similarly to the 18th hole at St. Andrews with a valley of sin short of the green. While the modern day version lacks character, the original was much more intriguing. In 1937, Byron Nelson drove the green and went on to win his first of two Green Jackets. It was shortly after this that the club would alter the design of the hole entirely. Perry Maxwell was the first to adjust the hole and even more recently, Tom Fazio worked on it. Let’s just say I hope they renovate it one more time. The year is 1934. Bobby Jones has just opened his new club in Augusta, GA and in March, he holds the first “Augusta National Invitation Tournament”. Players travel from around the globe to this eastern Georgia hamlet and see the splendor that Jones and MacKenzie have laid out. Horton Smith after winning the 1934 Masters. Coming down the stretch, the tournament is a two horse race between Craig Wood and Horton Smith. Smith holes a 20-footer for birdie on the par-5 17th hole and goes on to win by one. His birdie on the modern day 8th hole was the deciding factor in what would become the most sought after titles in all of golf. To this day, Horton Smith is one of only three Masters rookies to win the tournament. Bobby Jones switched the nines at Augusta National before the 1935 Masters. That makes Horton Smith’s victory the only tournament that finished on the modern day 9th green. 9: the number of birdies that Gary Player made in the final round of the 1978 Masters tournament. Player went on to shoot a 64 and beat a trio of golfers by a single shot. Starting the day 7 shots behind the leader, Player went out well ahead of the final pairing and shot an opening-nine 34. He birdied six holes on the back nine for a closing 30 and a one-stroke victory. It also happens that Gary Player won 9 major championships throughout his career with the 1978 Masters being his last. In honor of his 9 birdies and 9 majors, Mr. Player gets the 9th hole. The 10th hole at Augusta National begins a stretch of some of the best holes in the world. Dropping over 100 feet, the 10th features one of the largest vertical drops in championship golf. The hole plays about 60 yards longer than it did in 1934, but not all of the yardage was added because of technology. Bobby Jones brought Perry Maxwell to Augusta in 1937 to assist in some redesigns, including solving a drainage issue on the 10th hole. 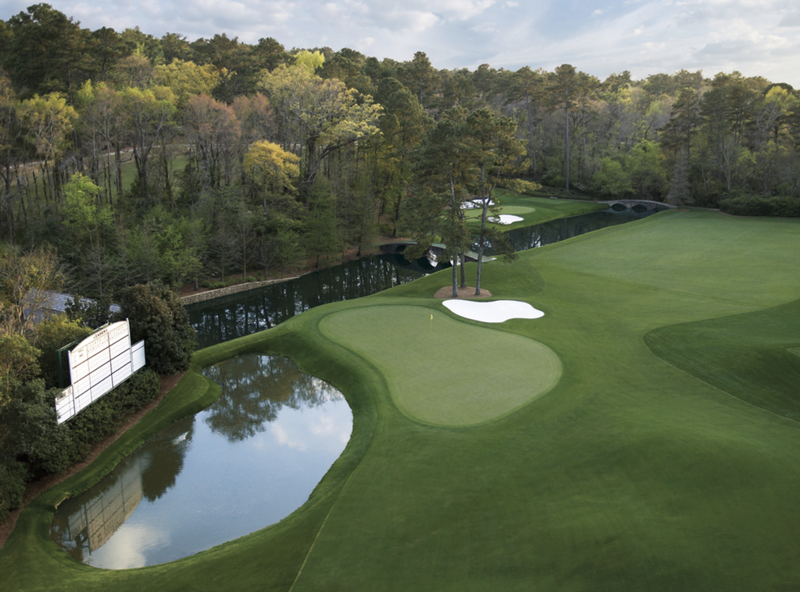 Maxwell moved the green 50 yards behind the original location and created an incredibly difficult second shot for Masters participants. The new hole left players a mid-iron to an elevated green instead of the short pitch to which they were accustomed. He chose to leave the large bunker that used to flank the green, as a tribute to Alister MacKenzie. Perry Maxwell is one of the most underappreciated architects in history. That is mainly because he does not have a lot in his repertoire. Still, his work at Southern Hills, Prairie Dunes, and Augusta National has produced some of the finest golf holes in the country. Herb Wind inadvertently influenced the Masters with only a few strokes of a typewriter. In 1958, the Sports Illustrated writer went back to his hotel room to describe the back-nine showdown between Arnold Palmer and Ken Venturi. After much deliberation, he titled his article, “The Fateful Corner” in which he coined the term “Amen Corner” to describe the 11th, 12th, and 13th holes at Augusta National. The start of amen corner, 11th green. It is with some chagrin that I name this hole after Mr. Wind. No offense to him, I am just not a huge fan of nicknames for stretches of holes (cc: Bear Trap). Great moments like Larry Mize’s chip in to defeat Greg Norman or Nick Faldo’s playoff victories are incredibly deserving of consideration. Still, the Amen Corner moniker will live on forever and Herb Wind will go down in history. Alternates for the 12th hole include Freddy Couples, Jordan Spieth, and the wind. In regards to Hogan, this one really was not my choice. Before the 1958 edition of the Masters, Augusta National dedicated The Hogan Bridge in honor of Ben Hogan’s scoring record. In 1953, Hogan recorded rounds of 70, 69, 66, and 69 for a four-round score of 274. The week that The Hogan Bridge was dedicated, a 28-year-old Arnold Palmer won his first of seven major championships. That week represented a passing of the guard from one golf generation to the next. Ben Hogan and Arnold Palmer at the Masters. Instead of just naming the bridge after Hogan, I am giving him the entire 12th hole. It is only fitting that one of golf’s most perplexing holes bears the name of one of golf’s most interesting personalities. Alister MacKenzie and Bobby Jones at Augusta. During the course of writing this piece, I had Dr. MacKenzie on a number of different holes. Originally, he was the 14th because that green is one of the few remaining complexes that features his original design. I also had him as the 18th to bookend Bobby Jones as the creators of Augusta National. Phil Mickelson is obviously the first person that came to my mind for this hole and it took a while to convince myself to change my mind. Phil’s shot from the right trees will go down as one of the most impressive shots in major championship history. However, in the end, it just made sense to name the 13th after Alister MacKenzie. One of the most remarkable holes in the world, the par-5 13th is the cornerstone of Augusta National. It is the hole that most takes your breath away. It is the pivotal moment in many Masters tournaments. It is a masterpiece. It is Alister MacKenzie. Luckily for all of us, Phil has had more than one amazing moment around Augusta National. During the 3rd round of the 2010 Masters tournament, Phil went eagle-eagle on 13-14 and got himself in contention heading into Sunday. Now, there have been 20 eagles on the 14th hole ranging from 1946 to 2016. In that respect, Phil’s shot is not all that special. The one thing that Phil has over the 19 others is that he went on to win. More than that shot alone, the 14th hole is the perfect depiction of Phil Mickelson. Its bunker-less design is unique, much like Phil. Its green is wild and untamed, much like Phil’s style of play. The 14th hole is Phil Mickelson and Phil Mickelson is the 14th hole. Let’s call a spade a spade: this hole is named after Sarazen based on history alone. None of us saw his albatross in 1935. Not many people did. Still, when something is called “the shot heard ‘round the world”, you name the hole after the player who hit it. What not many people know is that Sarazen’s albatross only helped him to get into a playoff with Craig Wood. Wood birdied the 72nd hole of regulation to force a 36-HOLE PLAYOFF. Yes, you read that correctly. The playoff format was originally 36 holes. During the playoff, only 5 birdies were made between the two players, and Sarazen won by 5 strokes. Gene Sarazen actually skipped the first Masters in 1934 because he had a conflicting event going on at the same time. As luck would have it, the second year would do just fine. Sarazen’s albatross put the Masters in the national spotlight. It already had the attention of golfers, but this made it national news. People started paying attention to this little tournament in Georgia, and the rest is history. In case anyone needs some background, Tiger Woods was a decent golfer in his day. He won a few tournaments and collected a check or two. However, in 2005, he faced the daunting task of Chris DiMarco. The two were separated by 1 stroke as they approached the 16th, and Tiger hit his ball clear over the green. His chip will go down as one of the most iconic moments in golf history. High five excluded, the magic that occurred around that green will be nearly impossible to duplicate. Tiger has had many special moments around Augusta National. I guess that is what happens when you have four Green Jackets in your closet. Still, his chip on 16 serves as a career-defining event. **Special Additional Name** I would like to name the pond on 16 after Robert Trent Jones Sr. In doing so, I would like to convert it into a wishing well in which players and fans can contribute money to help restore this hole back to some semblance of strategic decency. The Sunday pin is amazing and the skip shot in the practice round is fun, but it is nothing like the original MacKenzie hole. If you had not heard of that Woods guy, Jack Nicklaus might be a new name as well. Going into the back nine of the 1986 Masters, 46-year-old Jack Nicklaus faced a four shot deficit. He played 10-16 in 5 under par and had an 18-footer for birdie on 17. He buried the putt and went on to become the oldest Masters winner in history. Jack’s influence on the game of golf and the Masters cannot be understated. His persistent dominance was awe-inspiring. Everyone had counted him out during the ’86 Masters, but he found something within himself to shock the world. It is hard to imagine that anyone will play a more impressive back nine than Jack did 22 years ago. The scene on the 72nd green at the 1995 Masters was as emotional as it gets. On the Wednesday of tournament week, Ben Crenshaw was in Texas attending the funeral of his mentor, Harvey Penick. Penick had been Crenshaw’s coach for many years and taught him how to become one of the best putters in the world. Crenshaw got off to a respectable start, finishing T-16 after Thursday’s action. However, after a Friday 67 and a Saturday 69, Crenshaw found himself in the final pairing on Sunday. He shot a final-round 68 to win and finished the tournament without a three putt. Ben Crenshaw’s emotional embrace with caddy Carl Jackson showed how special the game of golf truly is. It is not about exclusivity and status. It is about the people and the memories that occur while playing the game. Harvey Penick had made a lasting impression on Ben Crenshaw through the game of golf. In honor of Mr. Penick and the sport we love so much, I would name the 18th hole after Ben Crenshaw. Of course, none of this would ever happen. The hole names will never change. Still, it is amazing to see just how much of our sport’s history has happened in this one ballpark. Players from all over the world have succeeded at ANGC and left a lasting mark on our sport. Augusta National will always be a special place, regardless of what we name the holes. Want more Masters? Check out our Masters page. Sign up for our newsletter to get a daily newsletter with analysis after each round.